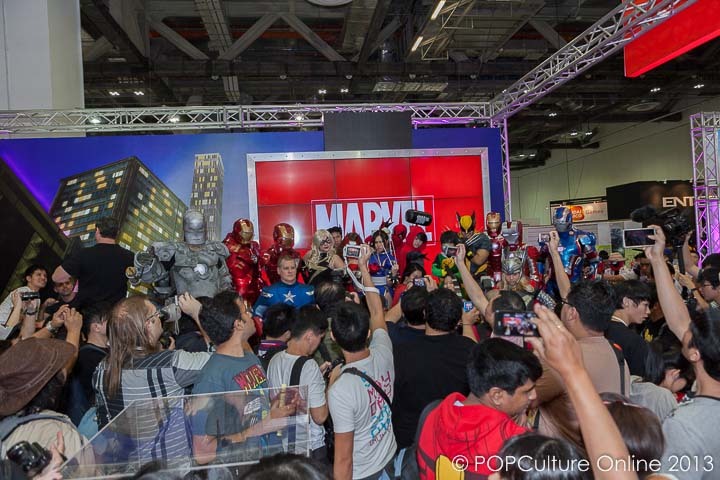 Held at the Marina Bay Sands over the first weekend of September is the Singapore Toy, Game & Comic Convention 2013 which aims to be the coolest event to hit town this year. 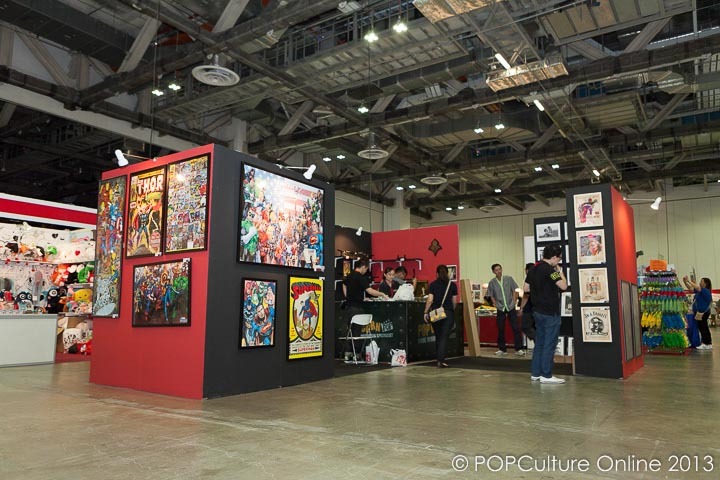 With the last two years showing that the team behind STGCC is serious about bringing both Eastern and Western Popular Culture content under one roof, Kenneth Wong reports from the convention grounds. 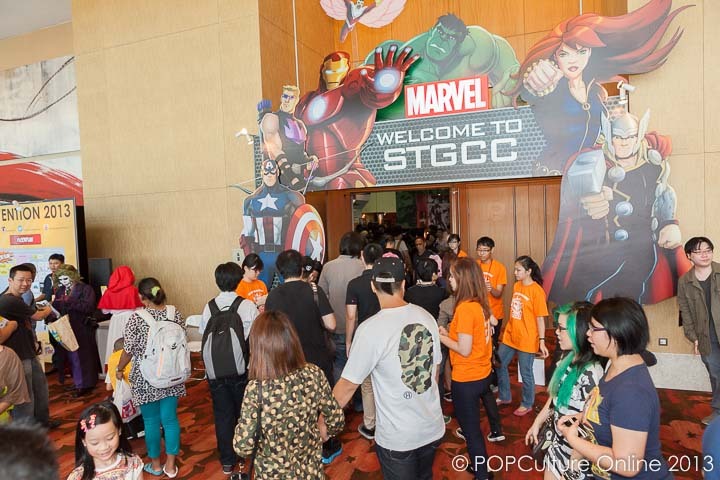 It is no secret that STGCC has always had a strong Western presence and just looking at the entrance to the convention hall, seeing the various Marvel heroes welcoming visitors to STGCC is enough to confirm that this year. From the huge Marvel booth where various goodies like posters and tee shirts are being given out as though it is Christmas to the Disney Infinity booth next to it that has curious visitors of all ages glued to the screens, it is no doubt who has a huge presence this year. Not that anyone is complaining especially Iron Man fans as both Hot Toys and Play Imaginative joins in the fun. With a life size “Hall of Armor” from the Iron Man movie series and the man behind the armor, Adi Granov coming down to meet fans, fans have been commenting that this is a step closer to what they call comic cons in the states. Comic book fans were also in for a treat as various big names in the comic industry such as David Mack & Joe Madureira were in town to meet fans and sign autographs. Other big names such as C.B. 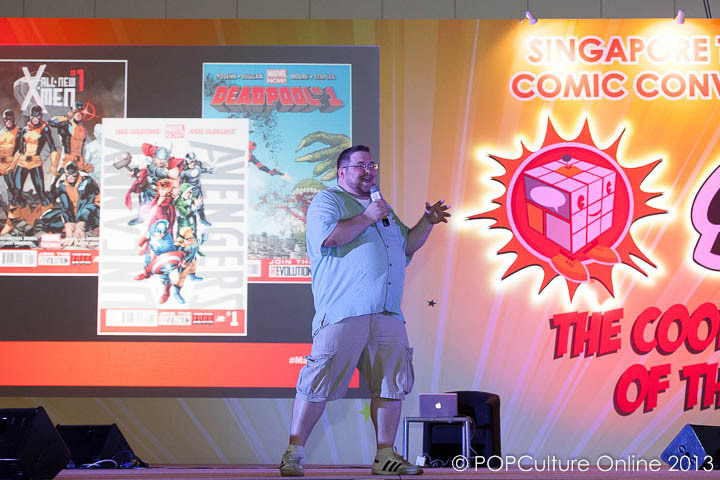 Cebulski and Cort Lane also shared with fans during their stage segments more insights into the world of Marvel and its comics and animation. 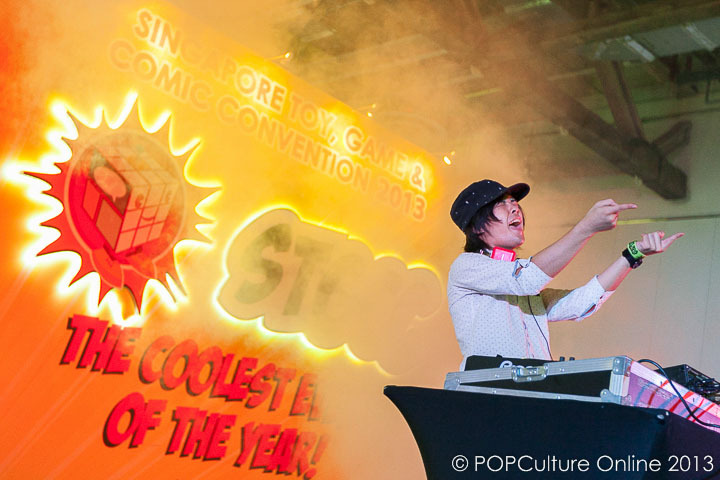 But with an aim where east meets west, the Eastern side of Popular Culture was also strongly represented with big names from the anime and gaming industry making their way down to this year’s STGCC. The man behind the Tales Of series, Hideo BABA was present as well to have his own stage segment where he explained more about the latest in the series, Tales of Xillia. He also shared exciting information on what fans can expect from Namco Bandai in terms of the Tales Of series. Closing his segment was a cosplay competition where the top 5 Tales Of cosplayers strutted their stuff on stage with a limited Tales of Xillia Playstation 3 console up for grabs. My own regret this year is not asking him where to get my hands on the teepo softoy. Not forgetting the anime scene is the man behind the characters such as Inori and Shu from the highly rated anime Guild Crown. Redjuice not only wowed the crowd with his live drawing of Inori but also took the time to meet fans and sign autographs. Fans of his also had the chance to get their hands on his various art books and other merchandise. Another highlight that many visitors to STGCC definitely looked out for was the ever colourful cosplayers who showcased their hard work and dedication to the hobby with some of the most amazing cosplays I seen so far. 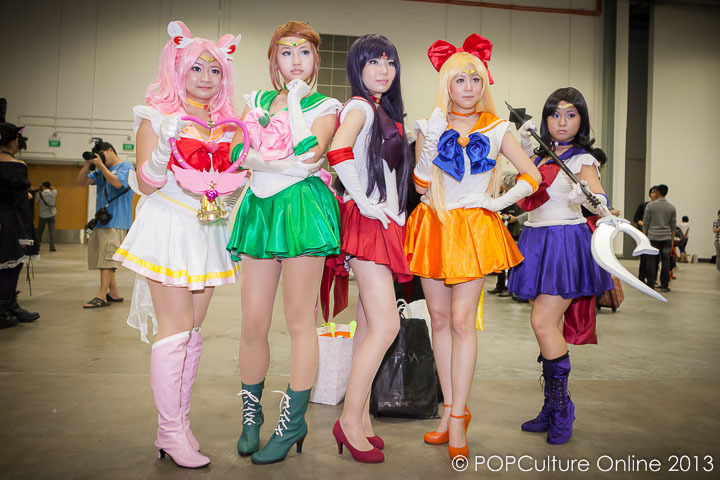 From the most incredible Mr Freeze I ever saw to almost the whole group of Dwarfs from The Hobbit movie and not forgetting an old classic, Sailor Moon, it was almost without a doubt that the cosplay community here is improving each year. Cosplay fans also had an exciting two days thanks to the good people behind this year’s STGCC who brought down two internationally known cosplayers, Vampy Bit Me and Aza Miyuko. If there was any doubt about STGCC’s aim to bring to visitors “East meets West” popular culture, this would settle it as both cosplayers come from different sides of the world yet have a common interest in the world of cosplay. Both spent time meeting fans, signing autographs and taking photos during both days and I do wonder if the queues at the walk of fame were a new record. Toy hunters were also spoiled with the amount of merchandise that was on sale at this year’s STGCC. From the Hot Toy Exclusives to fan favorite tokidoki by Simone Legno, those looking to add to their collection had lots to choose from. I myself was tempted to take out my ATM card and head to the nearest ATM machine to decorate my empty work desk but thankfully the huge size of Metroplex made me think otherwise. Of course my POPCulture Online team members who had more space went on a mini shopping spree and I do wonder if anyone bought that huge Justice League poster from the PopcornPop booth that I know some were eying. One of my favorite parts about STGCC is the Artist Alley where you find lots of hidden gems. From artworks done by local artist to even cosplay prints of well known local cosplayers, there is always something there that would make you very tempted to open your wallet. My favorite one was the caricatures drawing booth although somehow due to my crazy interview schedule, I had to give it a miss. Gotta remember to make it a point to visit it next year. 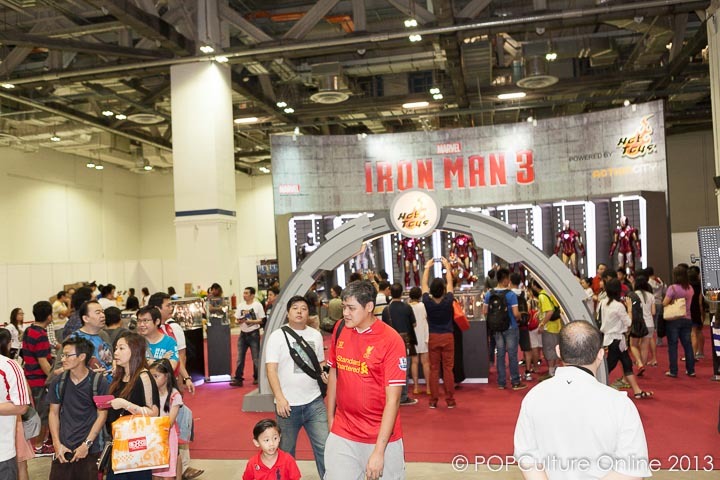 Overall this year’s Singapore Toy, Game & Comic Convention was another step in the right direction by the team at ReedPOP. Not that the previous years were not but somehow the jump in improvement this year just seems even greater. Never have I seen so much praise for the event in the social media sphere and I even had a comment given about how this year’s convention is a right step in the direction of conventions abroad. If anything, I have to give two thumbs up (I would give three but I don’t have another hand) for this year’s Singapore Toy, Game & Comic convention and applaud the team behind it. Even though the POPCulture Online team has had its work cut out with the increased in coverage, everyone looked like they thoroughly enjoyed themselves amidst the tired exhausted faces at the end of each day. 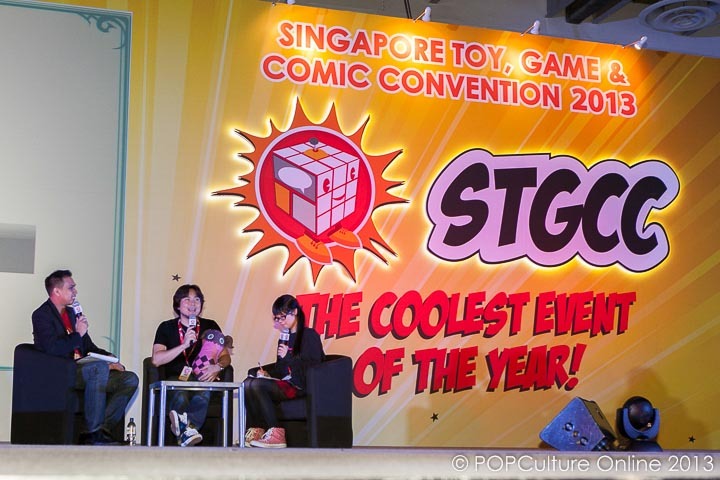 I guess the right term to use would be “Post STGCC Syndrome” and it looks like it will take quite a bit of time for everyone to get over the convention that proved to be the coolest of 2013.